It’s the unique sports car that Canadians have been waiting for. The Toyota 86 features a flat-four Boxer engine, rear wheel drive, remarkable balance and the aggressive styling to match. And new for 2018, the Toyota 86 GT ratchets up the style, technology and comfort to whole new levels. Every Toyota 86 is built for performance – and performance starts with power. There’s plenty under the hood thanks to a 2.0L four-cylinder Boxer engine. This engine is centre mounted between the front and rear axles, improving the front-rear weight distribution and lowering the centre of gravity for enhanced handling and stability. The Toyota 86 features the world’s only Boxer engine in a front-engine, rear-wheel-drive configuration. By separating the driving power and steering functions, and using the rear wheels to propel the 86 forward, steering ability is maximized to deliver greater agility and responsiveness. The D-4S fuel injection technology combines port and direct injection systems to enhance torque at low engine speeds, increase maximum output, and boost fuel efficiency. The Toyota 86 is offered with a choice of six-speed transmissions. With the manual gearbox, the engine delivers a peak 205 horsepower and 156 lb-ft of torque, and the driver enjoys precise shifts with a short throw. With the automatic transmission, peak horsepower and torque figures are 200 and 151, respectively, with the driver enjoying aggressive upshifts and sporty re-matched downshifts, initiated by steering wheel mounted paddle shifters. Sport tuned suspensions with stabilizer bars, electric power steering, and ventilated front and rear disc brakes contribute to the Toyota 86’s precise handling and confident control. Coupes are more than sporty performers – they’re also beautiful machines. The 86 presents its performance credentials through bold, aggressive styling. The 86’s Boxer engine – with its horizontally-opposed cylinders – is compact and flat, set further back in the chassis to enable a lower, more aggressive front hood. The vehicle’s low stance is enhanced by a powerful front end featuring sharp lines, a wide grille and angular LED headlights. The roofline contributes to its low, sleek profile and aggressive curbside manner. More than just good looking, the body is built from highly rigid yet lightweight components, aluminum hood, and resin fuel tank – all with the goal of keeping the total vehicle weight under 1,300 kg for an agile and responsive driving experience. Other features of note include variable intermittent wipers, dual exhaust, and 17” alloy wheels clad in performance summer tires. Inside, the cabin is driver focussed with room for four adults. Deeply bolstered sport seats keep driver and front passenger firmly in place through the corners, while the low seating position enhances the driver’s connection to the road. The leather-wrapped and perfectly circular steering wheel provides exceptional grip – driving gloves optional! – and excellent turning performance. In the back, the passenger side rear walk-in assist provides convenient access to the rear seats, which fold flat for those times when the space is needed for sports gear, track tires, or other cargo. 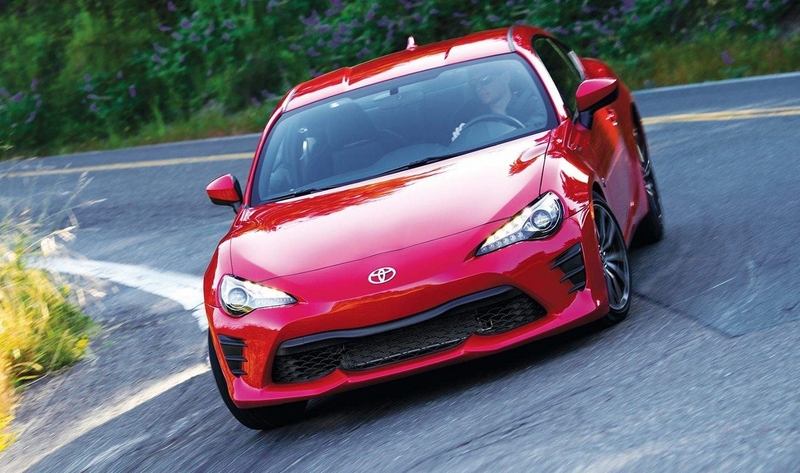 The 2018 Toyota 86 also provides driver and passengers with the benefits of state of the art safety technologies, including the Toyota Star Safety System, six air bags, front seats with whiplash injury-lessening headrests, a tire pressure monitoring system, and more. The 2018 Toyota 86 is offered with a choice of manual transmission (Starting MSRP: $29,990) or automatic transmission (Starting MSRP: $31,190). This model features an eight-speaker Display Audio system with 7” screen, Bluetooth connectivity, automatic sound levelizer and steering wheel-mounted controls, automatic air conditioning, power door locks, a multi-information display, tachometer, dual trip odometer, leather-wrapped shift knob, aluminum sport pedals with rubber inserts, 12-volt power supply for personal electronics, cruise control, keyless entry, and more. The 2018 Toyota 86 GT is offered with a choice of manual transmission (Starting MSRP: $33,260) or automatic transmission (Starting MSRP: $34,460). This model is enhanced with an anti-theft alarm system, a rear spoiler, the Smart Key System with Push Button Start, fog lamps, dual zone automatic climate control, heated front seats, leather seating, a 4.2” display conveying vehicle performance data, and more. The 2018 Toyota 86 is now on sale at Toyota Dealers across Canada. For complete and up to date details and specifications, visit www.toyota.ca/86.